Being a crime and mystery novel, the story revolves around Tina, a bright executive who works at a call center. The story proceeds with her love affair when, all of a sudden, a stalker creates havoc in her life. Tina's life at the call center is quite hectic and her office romance brings some spice into her life. But she cannot live peacefully as a stalker starts threatening her. The cyber-crime investigating police officer, Vikram, is deputed to deal with this case and he arrives at the call center. Unfortunately he meets his ex-girl friend, Leila, here, who is now married to someone else. But the real mystery begins soon after this event. One evening, Tina stumbles upon a plot which turns her life upside down. My Review : 10 days offers you something different and definitely more than you expect when you begin. There is a lot happening in the book, mostly with and around Tina but that doesn't let you lose track of any of the cast introduced in the flow. There are sunshine moments when Tina thinks of her childhood and her old friends and then there are creepy moments when as a woman I could feel and relate the pains of being stalked , being terrified even of walking down the street after dark. What put me off a bit was not too much happening , but too many unnecessary scenes and casts. I did not like knowing of all and every person on Tina's team nor did some of the crimes seem important enough being written in the plot. The multiple rackets being run in the company were spread a little thin. Though some of the culprits were hinted at different stages, it was not too difficult to guess them except the stalker. that was quite an interesting twist. 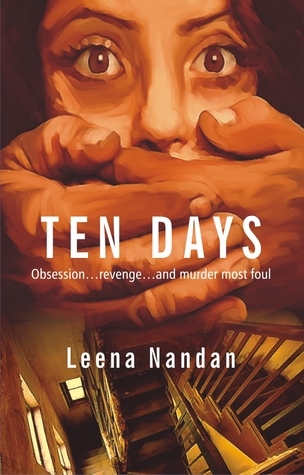 Leena's writing is very much realistic and I like the way she has described the call center culture and in general the behavior of different people around us. Silent Reading Meet in Delhi !